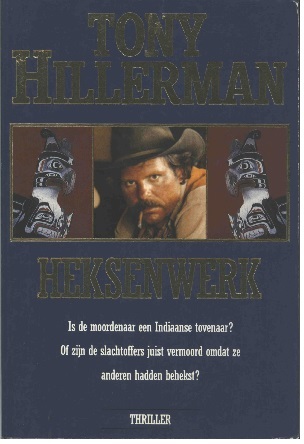 This is the first Dutch paperback edition of Skinwalkers, the seventh the seventh book in Tony Hillerman's Navajo Mystery Series. This edition was published in 1989 by Utigeverij BZZTôH in 's-Gravenhage, Netherlands. This edition is a special crime novel denoted by the BZZTôH-Crime on the spine and front cover. The text was translated from English into Dutch by Wiebe Buddingh' with the title translated as "The Work of Witches." The cover design by Julie Bergen features a panel of three photographs: mirror images of a Kwakiutl totem pole to either side of a picture of a cowboy. Binding: Full-colored paper covers with author, title and publisher printed vertically on the spine.